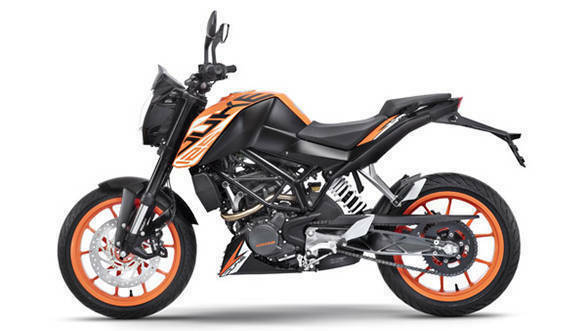 KTM 125 Duke sees a price hike of Rs 6,000 in the first week of the new financial year. The 125 Duke now retails at Rs 1.25 lakh ex-showroom pan India. That said, the 125 Duke is now close to the recently launched Yamaha MT-15 with a price difference of only Rs 11,000 over the 125 Duke's ex-showroom prices. The 125 Duke also rivals the Bajaj Pulsar NS200 and the TVS Apache RTR 200 4V. The KTM 125 Duke is powered by a 125cc engine that churns out 14.5PS at 9,250rpm and 12Nm of torque at 8,000rpm and the engine is mated to a six-speed gearbox. The 125 Duke boasts of features like an USD (upside down) fork setup in the front and radially mounted front 300mm disc brake. The bike also gets an aluminium swingarm with a mono-shock absorber with 10 preload settings. The safety features include a single channel ABS (Anti-lock braking system) with a rear wheel lift protection system. The bike is available in three colour schemes - orange, black and white. It is yet to be seen when the Austrian manufacturer will update the engine of the 125 Duke to comply with BSVI norms. KTM 390 Adventure spotted once again  What do we know so far?